My husband and I have adopted thirteen children. I realize it sounds like a crazy number to most people and we have lost friends due to the sheer number of children we chose to adopt. According to Good House Keeping, in 2014 there were 107,918 foster children eligible for, and waiting to be adopted. However, only 50,644 foster kids were adopted. That being known, which child or children shouldn’t we have adopted, left to join the ranks of children awaiting adoption? Adopting thirteen children was not a choice taken lightly. My husband and I considered everything from the number of rooms we had available to the extra laundry it would entail. We are also aware that each of our children has had a variety of trauma and losses and would need individualized treatment systems. In addition, they each have very different personalities and individual needs. By adopting thirteen children, we pledged to take care of them as our own and be aware of these differences. It is not a decision to take lightly, but it is a big decision and is personal. Others outside of your family cannot make that decision for you, but keep in mind that having their support is helpful. Adoption can be tumultuous with their trauma inserting its two cents at the most inopportune times. Like any criticism, take it seriously, weigh it and either throw it out or consider it. They may be pointing out reality to you that you do not see with your excitement of adding a new member to your family. Their criticism may also bring up a valid point that you can prepare for before the child is placed in your home. You and your spouse need to both be on board with this decision and talk about each aspect. It might seem that James and I make these decisions lightly, as if getting a puppy, but we have continuously talked about adoption. It is our life’s passion and we are committed to being ready at a moment’s notice. We are prepared with the answer to the question before the question is asked. Adopting is a personal decision and no one else can make that decision for you. 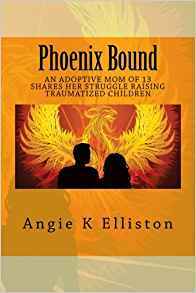 The chapter entitled, ‘Everyone said NOT to do it’, in PHOENIX BOUND, is an example of our decision to adopt our third child.